Learn how to do some simple queries to extract data from the Hadoop/HDFS based HBase database using its REST API. 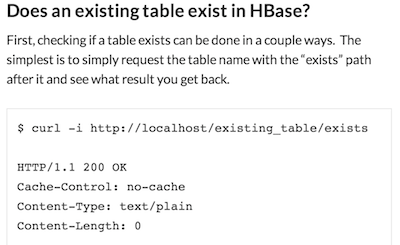 Are you getting stuck trying to figure out HBase query via the REST API? Me too. The main HBase docs are pretty limited in terms of examples but I guess it’s all there, just not that easy for new users to understand. As an aside, during my searches for help I also wanted to apply filters – if you’re interested in HBase filters, you’ll want to check out Marc’s examples here. What docs do you find most useful? Leave a comment. Should someone write more books or something else? Does a specific table exist in HBase? First, checking if a table exists can be done in a couple ways. The simplest is to simply request the table name with the “exists” path after it and see what result you get back. Here I use the curl “-i” option to return the detailed info/headers so I can see the HTTP responses (200 vs 404). The plain text results from the command are either blank (if exists) or “Not found” if it does not. To do this with curl, you want to use HBase scanner techniques to accomplish this (the shortest section in the official docs it seems). curl -vi -H "Content-Type: text/xml" -d '<Scanner batch="1"/>' "http://localhost/existing_table/scanner"
Note the XML chunk in the statement that tells it how many records to return in the batch. That’s as simple as it gets here! Now you can create a basic script the grabs the latest timestamp from the HBase query and decides what to do with it. Here we just assign it to a variable and let you go back to implement as needed. If you like this, follow me on Twitter at http://twitter.com/1tylermitchell or with any of the other methods below.